How an Enugu boy kidnapped his Uncle - BlogIT with OLIVIA!!! On Saturday April 2, 2016, four armed men stormed the country home of a Liverpool-based octogenarian, Chief Edwin Chime, at Obinagu Town in Udi area of Enugu State and abducted him.The gunmen, who were armed with three locally made guns, whisked him away in an Audi 80 saloon car to an unknown destination. Twenty-four hours after his abduction, his kidnappers, contacted his wife and demanded a N200 million ransom. The amount was subsequently reduced to N500, 000 and the 92-year-old man was released, 48 hours after it was paid to the kidnappers. Miffed by the news of the octogenarian, who is based at the United Kingdom, the Inspector General of Police, Solomon Arase, was said to have reportedly deployed operatives of his Special Intelligence Response Team, SIRT, to Enugu State to assist the State Commissioner of Police, Ekechukwu Nwodibo, in tracking down the kidnappers. Crime Guard gathered that the SIRT operatives, on arriving Enugu State, went after users of the mobile phone which was used for in the ransom negotiation and they ended up apprehending three of the suspects, including one of the octogenarian’s nephews , who organized the kidnap. Sources disclosed that the suspects, identified as, Chinonso Onyebuchi, Chukwudi Azemenei and Collins Chime, were arrested separately by the operatives at Nnsuka, Enugu and Udi areas of the State. Onyebuchi, who is 28 years old, was described as the leader of the gang and ransom negotiator, Azemene, 22, was said to be the one who picked the ransom from the drop point, while Chime, 20, provided information and initiated the kidnap. 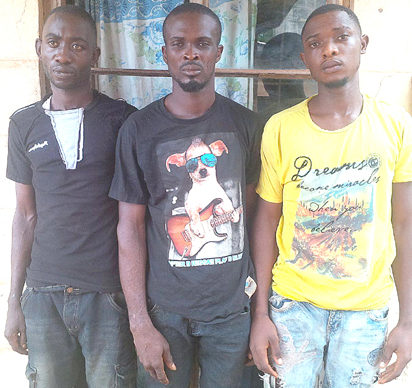 A source, who spoke to Vanguard on the condition of anonymity, disclosed that the three suspects were arrested less than eight hours after they released their victim, and the sum of N170, 000 was recovered from them. The source added that one other member of the gang, identified as Ifeanyi is still at large. When Vanguard interviewed the suspects, Chime disclosed that his uncle’s refusal to give him money to start off a business, was the reason he gave him out to kidnappers. Chime explained that the victim is his father’s elder brother and he approached him in January 2016, to give him some money but he did not. “My uncle is based in Liverpool, United Kingdom. He came home in December for the holidays and I approached him and told him that I needed money to start a small business. He gave me N5,000 to go back to Lagos and join my cousins who are hustling there. I took the money but I wasn’t happy with what he told me because I wanted to go the university and I needed a small business to support myself while in school but my uncle didn’t reason with me. Last month I was at Four Conner in Enugu to see one of my friends known as Coutonu, but while I met him, one of his friends, Chinonso showed up and while we discussed he told me that he was into kidnapping and he would like to recruit me if I could get him people to kidnap for ransom. Because of the money I was looking for I accepted his offer and told him that there was a woman in my town in Udi, known as Odele, whose children were very rich and my Uncle who just returned from the Uk. Chinonso told me not to worry that he was going to take care of the business. Four days after our first meeting, Chinonso met me in Udi and he came along with Chukwudi and one Ifeanyi. They also brought an Audi car. I don’t know how they got the car. “We proceeded first to Odele’s house and we didn’t find the woman in the house, from there we went to my Uncle’s house and we abducted him. He was taken to Chinonso village in Obiagu Town in Awgu Local Government Area of Enugu State. I didn’t go with them the first day, but I joined them later the next day. I was the one who fed my uncle but I was putting on a mask so he could not see my face. We treated him fine. “We also bought him his drugs. Chinonso was the one doing the negotiation and when the ransom was paid, Chukwudi picked it up at Four Conner Junction and I was given N50, 000 as my share. Chinonso, said that I was a small boy and new in the business and that was why he gave me that amount. I had spent just N5,000 from the money when the police came and arrested me. I feel very bad, getting myself into this. I wish my uncle would forgive me,“ he pleaded Chinonso, told Crime Guard that this was his first kidnapping operation. He explained that he did car snatching but he decided to venture into kidnapping because he learnt it was less risky. “I am a native of Obiagwu in Agwu Local Government area of Enugu State. This is my first kidnapping operation. I ventured into it because Collins told me he had rich people who could get us good money. I met Collins Last month, through one of my friends know has Coutonu. He told me that Collins was his boy and he normally assist him to convey stolen cars to the destination he wanted. Collins on his part told me that after they had snatched a vehicle, they would tie the owner of the vehicle and dump him in a bush and would release him when they are successful with the crossing of the vehicle. Then he told that there was a rich woman in his area and one of his uncles that his based in the Uk and he would want us to kidnap them and raise some money. “I contacted Chukwudi, he is my classmate in secondary school and he gave me a number of a guy, Ifeanyi, whom he met at the Ikoyi Prisons in Lagos State. When I met Ifeanyi, he suggested we got a car for the job and we went to Umunede in Delta State and we snatched the Audi saloon car from the owner. We drove down to Udi, we didn’t meet our target at the first place he took us to but we kidnapped a man at the second house we went to. The man was kept in my family house in Awgu and when the ransom was paid I got N112000 as my share and I spent all of it on drinks and women. I also lodged in a hotel before I was arrested. “ The Enugu State, Commissioner of Police, who paraded the suspects before newsmen said the arrest of the suspected kidnappers was made through a careful operation following a tip-off by some public spirited individuals in the state. Nwodibo noted that two notorious gangs of kidnappers were rounded up by the police, explaining that the first syndicate led by Etim Amos of Abiakpo Ibo Road, Ikot Ekpene was behind the kidnapping of Mr John Abugu at GRA, Enugu; Mrs. Jane Ekweremadu and Mr Brooks Okwara at Agric Bank Junction, Independence Layout Enugu as well as Mrs Sandra Onu at New Haven, Enugu. .